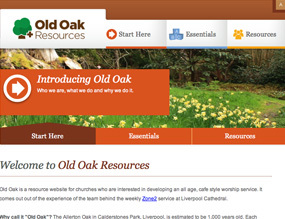 The team behind Zone2, the weekly all age café style service at Liverpool Cathedral have launched www.oldoakresources.com – a new web-based resource to help churches develop a similar service. The old oak team are also available to work alongside parishes in the Diocese of Liverpool as they go through the process of starting their own café church. Supported by funding from Church Commissioners, the website is part of a package that aims to share the experience gained by the Cathedral since they launched Zone2 in 2011. Zone 2 has grown steadily in those first two years, from a planting team of nine adults and nine children. It now attracts 50 to 60 worshippers most weeks and they are also launching a 4pm service on 21 April. Most of the work creating the website was done by Mike Prescott, who is mission pastor at the Cathedral, supported by Church Commissioners. The site provides enough resource to set up and run a complete service – from the essentials churches need to think about to provide a friendly welcome and well run service, to the talk, sung worship and creative prayer ideas. It includes complete service outlines plus a blog area so that you churches can get involved in conversations about ideas, problems and solutions. There are already more than 100 resources on the site, and it will continue to grow every week. The team is also available to partner more intensively with one or two churches within Liverpool Diocese at any one time, offering focused support, encouragement and coaching. The Allerton Oak in Calderstones Park, Liverpool, is estimated to be 1,000 years old. Each spring hundreds of daffodils bloom in the shade of the Old Oak, protected by the fence around it, and spreading like crazy into the rest of the park. That captures the cathedral's hopes for this project. It is hoped that "Old Oak" will give shade and protection for similar new, small, fragile, colourful, life-filled projects in the Diocese of Liverpool and beyond.